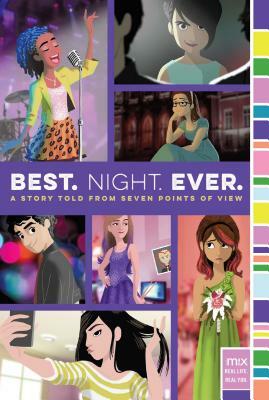 Love Actually meets Adventures in Babysitting in this “fun, fresh” (Kirkus Reviews) novel written by seven authors about seven classmates who are preparing for a crazy night at their middle school dance. One thing’s for sure—this entire crew is in for one epic night! Gail Nall, Dee Romito, Rachele Alpine, Ronni Arno, Alison Cherry, Stephanie Faris, and Jen Malone have created a charming, hilarious, and relatable novel that’s perfect for anyone who can’t wait to dance the night away. One of Rachele Alpine’s first jobs was at a library, but it didn’t last long, because all she did was hide in the third-floor stacks and read. Now she’s a little more careful about when and where she indulges her reading habit. Rachele is a high school English teacher by day, a wife and mother by night, and a writer during any time she can find in between. She lives in Cleveland, Ohio where she writes middle grade and young adult novels. Visit her at RacheleAlpine.com. Alison Cherry is the author of the YA novels Red, For Real and Look Both Ways, and the middle grade novels Willows vs. Wolverines and The Classy Crooks Club. She is a professional photographer and spent many years working as a lighting designer for theater, dance, and opera productions. This whole “writing books” thing is just a cover for the international crime ring she runs out of her Brooklyn apartment. (Shhh, don’t tell.) Visit her online at AlisonCherryBooks.com. Stephanie Faris knew she wanted to be an author from a very young age. In fact, her mother often told her to stop reading so much and go outside and play with the other kids. After graduating from Middle Tennessee State University she somehow found herself working in information technology. But she never stopped writing. When she isn’t crafting fiction, Stephanie is indulging her gadget geek side by writing for online technology sites. Her work is regularly featured on the small business blogs for Intuit and Go Payment and she is a featured columnist for SmallBizTechnology.com. She lives in Nashville with her husband. Dee Romito lives in her hometown of Buffalo, New York, where she and her family are steadily checking items off their own bucket list of adventures. You’re likely to find her at the local ice cream shop, writing at a café, or curled up on the couch with her cats. And while she does her best to be a grown-up most of the time, giggling with her BFFs is still one of her all-time favorite things. To join the fun and create your own bucket list, visit TheBFFBucketList.com.